Builder show and discuss their progress. Type of boat I like: Anything you paddle. Well I am progressing enough that I thought a build thread was due. Being my first build I am learning lots and think I could significantly improve a second go round. I am hoping to catch some fish this summer. And yes it 25 degrees outside so filleting is commencing in the living room. Its good to be the king. wow.... if you're married, you have someone special! jem wrote: wow.... if you're married, you have someone special! It's looking good Grant. Presumably you are in the Northern hemisphere and referring to degrees F - 25 degrees C would be perfect conditions. Should be right for a spring launch and a nice summer on the water . Laker 13 - christened and slimed (just). Ditto, can't talk mine into letting the Harley sleep inside during winter, and after her seeing the mess building boats make in the shed, doing it inside is not an option. Period. Full Stop. End of story. Nada. Not on. Yeah I am referencing degrees Fairenheit. I am located in Indiana. My golden retriever is a little distraught at the boat since it displaced his favorite sleeping spot. 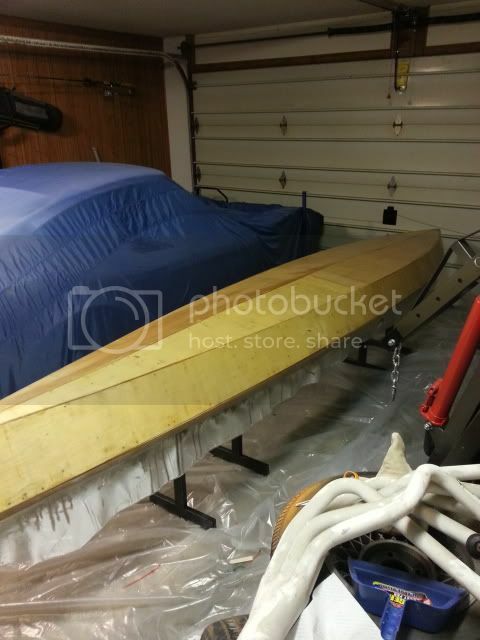 If the weather warms up I'll be able to drag the boat outside and get some sanding done. The epoxy is going to take some patience. I fill a hole and it dries half the volume, meaning I get to do it again. I must say I am enjoying the process. There is a nice balance between work invested and seeing results. I can see why people build multiple boats. When I cut out the panels last spring I had lost interest and stuck them in the shed. Being that I had already purchased the epoxy I knew this had to be done soon since it can't sit around forever. Little did I know the fun part was right ahead of me. Stiching was a blast, getting to see the boat come together. I'll get back to restoring my 240z this summer if I can put down my fishing pole. Well I rough sanded the fillets and have some low spots to fill. Not to mention the darn drill holes that dry down to nothing. I might try gluing bamboo skewers in if I had to do it over. That might make it a one step patch. The boat is looking good. I love the lines on it. It is begging to get in the water. 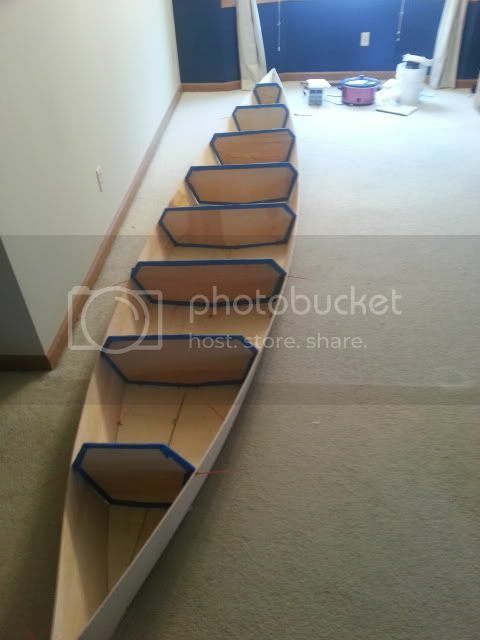 Should I do a saturation coat of the plywood before fiberglassing the hull? 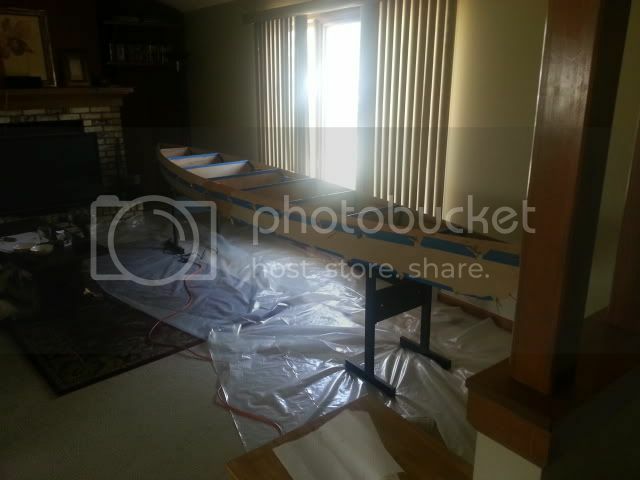 grant83 wrote: Should I do a saturation coat of the plywood before fiberglassing the hull? You can. If you do, try to get the fiberglass on within 72 hours of the saturation coat. Otherwise you'll run the risk of amine blush forming. If 72 hours does pass, perform a light sanding to scuff all surfaces and then solvent wipe. Keep the surface clean andn don't touch with bare hands (oils from your hand could effect epoxy bond). Then apply fiberglass. The exterior was sanded and ready for glass. I went to put away the sander and bang. I turn and see the boat bouncing on my concrete driveway. Sometimes you know you should have quit sooner. Upon inspection the top panels cracked on the ends and the center seam for about six feet. After the tears dried, I got back to fixing the seams today. Nothing permanently damaged other than my pride. As with most new skills Mr. Murphy throughs in his two cents. Good news is I can heat the garage enough to cure expoxy. Should have some glassed pics soon now that the weather isn't an issue. I had to reclaim the living room. It was starting bug me and I am not sanding in the house. No progress today since its raining on my day off.